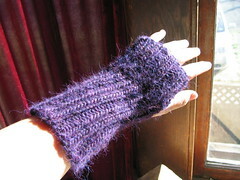 I was going to submit this to a knit zine, but never got around to it — I wanted to get some better pictures first. And now it’s just about Spring again, so I figured I might as well post the pictures (though I wanted better ones) and pattern now, or else I’d have to hold on to it until Winter again. So the zine’s loss is your gain! 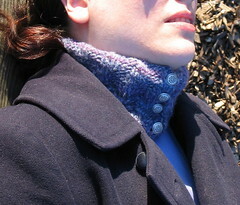 Download the Whirlwind neckwarmer pattern here. 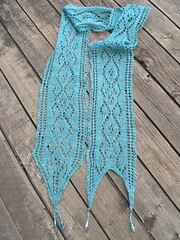 If you knit this, I would love to link to pictures of your version! Please send me a URL and I will link to you. I finished the laptop sleeve this week! It came out quite nice; I think it will do a great job of keeping my Macbook from getting scratched! Here is the pattern. 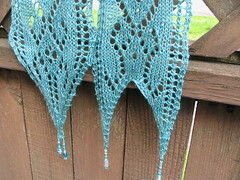 It takes three skeins of Cascade 220 (two main color, one contrast color), and is knitted in the round, double-stranded. It has a zipper around three sides, so you can open it up all the way instead of having to slide the laptop in and out of a pouch-type bag. 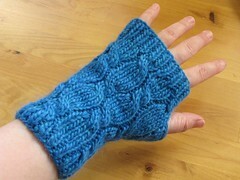 It’s a quick knit and lots of fun. 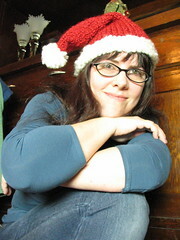 I was thinking about making a Santa hat. Didn’t have the right yarn on hand, didn’t have time to go to the yarn shop. 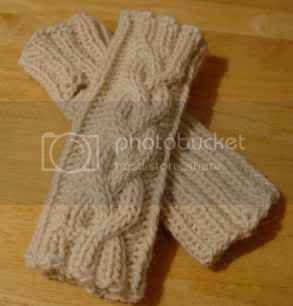 I wanted bulky yarn, with something that would make a nice woolly white part. Important note: There are two methods included here — the quick and dirty triangle shape which takes no thought whatsoever, and makes a right-triangle shaped hat (the Adult pattern), and the more normal hat with evenly distributed decreases which requires one to count a bit (the Baby pattern). You can knit either hat for either size — just change the number of cast-on stitches. I recommend the Baby hat method, even for adults, as it makes a nicer shape. But the Adult hat is slightly faster. Gauge note: The gauge given here, 2.5 stitches/inch, is using the Light and Lofty yarn around the brim. 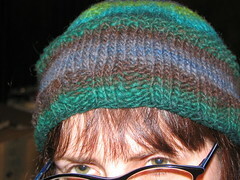 The Homespun gauge will probably be smaller, but in the hats I made, it didn’t matter. Yardage note: I don’t know exact yardage, but it was very little. You should be able to make several hats from a skein of Light and Lofty, and at least a couple if not more from a skein of Homespun. Size note: To make a hat for toddler or child size, you will have to extrapolate, as the baby size is designed for the smallest babies. Some folks have found that the baby hat comes out fairly small, so add some stitches to make this for larger babies, toddlers, etc. The gauge is really hard to tell with the L&L; I just winged it and it turned out OK. Looks as if I was getting about 2.5 stitches/inch. The Homespun gauge is smaller but it didn’t seem to matter. Cast on 44 stitches in the white yarn. 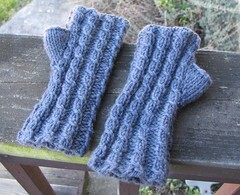 K all (garter stitch) for 1.5 – 2 inches, whichever you prefer. 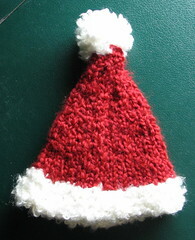 Knit stocking stitch until the cap is 4″ tall. Repeat from * until you have decreased to 12 sts. 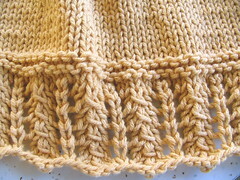 Break yarn, leaving about an 18″ tail, then pull the leftover yarn through the last stitches to make the tip of the hat. Sew up the seam down the back of the hat. Make a pompom with the white yarn and attach it to the top of the hat. A note about the hat: by doing the decreases this way you end up with a hat that is a right triangle. This means that the hat is longer in the back. For a Santa hat that looks just fine. But if you want it to be more normal-shaped you just put the decreases all the way around instead of on the edge. 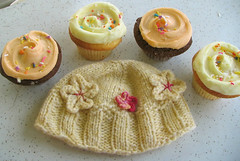 The picture to the left is the baby version of the hat, which uses this method. If you make one of these please send me the URL to your pictures so I can link to you here! And MERRY CHRISTMAS! 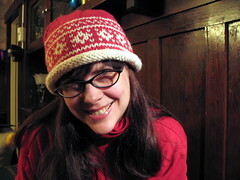 The hats are made with bulky yarn so they knit up fast. 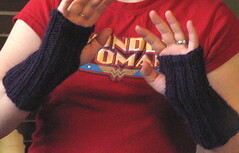 And it’s fun, because the knitting changes so frequently. You keep saying to yourself “one more round… just… one… more…” because you want to see how the color pattern develops. Download Madison’s hat pattern here. 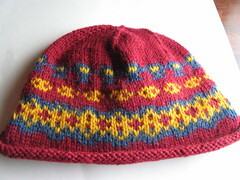 This pattern is for a simple top-down hat from one skein of Noro Kureyon. 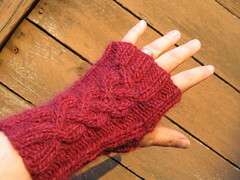 (It’s actually the second pattern I wrote, last fall, so it had to be simple.) 😉 It’s really very basic — if you haven’t knitted a hat before, this is a good first pattern. I didn’t post the pattern here sooner, because it was going to be published in an online knitzine — but the knitzine ended up not being published at all, so here is the pattern, better late than never. 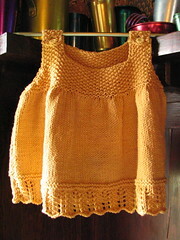 If you knit this, send me your URL if you post pictures of it and I’ll link to your pictures here. 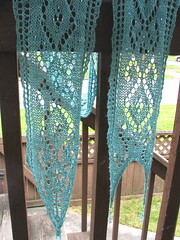 This is a bit different from my other knitting posts. 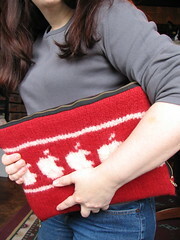 Because this time, I not only finished knitting something… I designed it and wrote up a pattern for it as well. 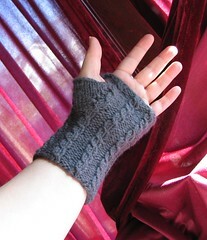 I basically wanted wristwarmers that didn’t cover the thumb or the knuckles, because the ones I have that do interfere with my typing. And I wanted to try a cable, a really obvious one. But not just a plain rope cable, as that seemed a little too boring. 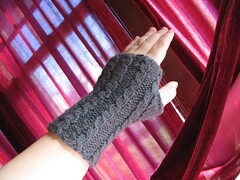 So I went off looking for a cable pattern I liked that would fit on the back of the wristwarmers. I found a loose braid in the Knitters’ Bible (I think) and liked it, so that is what I used. 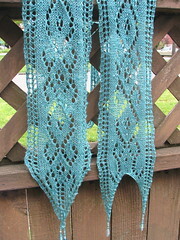 You can download the pattern I wrote right here. If you like it, please let me know. 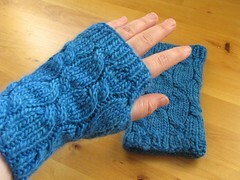 Striped wristwarmers by soomp — they look really nice in Paton’s SWS! 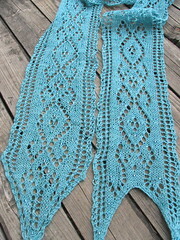 Three pairs by Heather including another gorgeous Patons SWS pair. 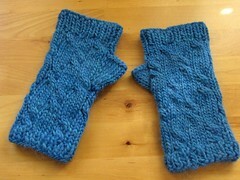 Blue wristwarmers by knitty mcknitknit in pretty Manos yarn!